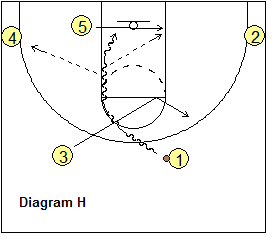 Home › Offenses › Dribble-Drive Motion Offense › Dribble-Drive Motion Offense - More! 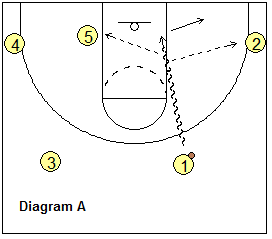 Basketball Offense - the Dribble-Drive Motion Offense - More! 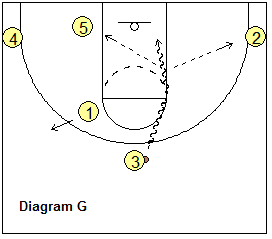 The "dribble-drive motion offense" is a very popular motion offense that utilizes guard dribble-penetration as the key to creating offense. It is seen at the college, pro, and high school levels. 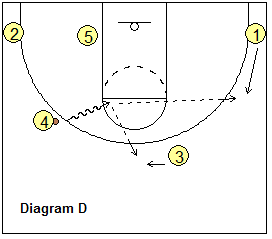 To understand the basic offense and rules, first see the "Dribble-Drive Motion Offense - the Basics" article. What you read below and the diagrams that I have provided here are based on some things that our own high school team has done, and also from what I have learned from studying Memphis game tapes... and then simply diagramming what I am seeing. There are many, many options. Mainly, it's just teaching your players the basics of the offense, the rules, and then just "letting them play" basketball. 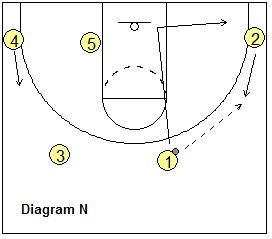 This is a guard-oriented offense that features spreading the floor and dribble-penetration to the rim for lay-ups or kick-out three-point shots. Coach Walberg uses the term "key or 3" meaning either a shot in the paint, or a 3-point shot. 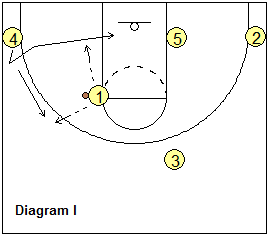 This offense uses a 4-out set (diagram A below). You need four perimeter players who can handle the ball and attack the seams 1-on-1 with dribble-penetration and then finish, and who can also catch-and-shoot the 3-point shot effectively. On dribble-penetration, the ball-handler has three options... (1) finishing the lay-up, (2) dumping it to the post player on the opposite block, or (3) kicking it out to the three point arc for the outside shot. Perimeter players move and rotate to specific spots. Very little screening is used, as screening tends to clog the driving lanes (seams). 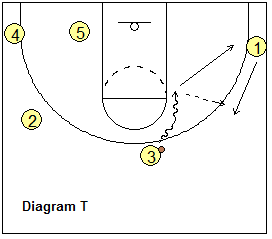 Good spacing with two guards on top and two deep in the corners really opens up those seams for dribble-penetration. Now let's look at some diagrams and offensive flow. In diagram A, as the ball is brought up the court, O5 is opposite and O2 is deep in the corner. 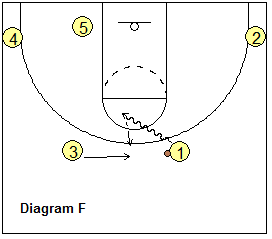 This gives O1 the very first chance to attack with the dribble-drive. 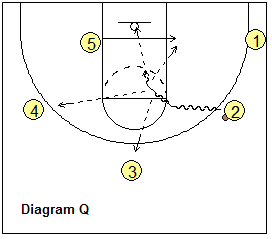 O1 has the options of finishing the lay-up, dumping it to O5, or passing outside to O2. 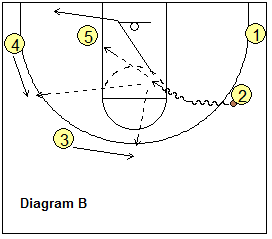 In diagram B, O2 has received the pass and could shoot the spot up 3-point shot from the corner. O1 moves out to either corner. 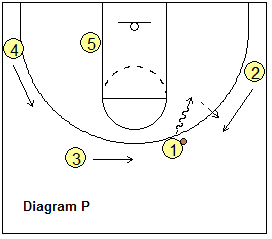 Now O2 looks to attack with the dribble-drive and again will either finish, dump pass to O5, or kick the pass out to the perimeter. If the ball goes to O4 (diagram C), O4 could pass to O3. Here we have continuity as O3 can start the whole motion scheme over again (notice that diagram A and C are almost identical). But let's back up to where O4 gets the ball on the skip out pass from O2 (as seen in diagram B). Instead of passing out to O3 (as seen in diagram C), O4 could dribble-drive (diagram D) and score, or kick the ball back outside. If the ball is passed out on top to O3 (diagram E), O5 locates to the opposite low block, O4 moves through to the opposite corner, and O3 can now attack the left seam, a mirror of attacking the right seam above (diagram A). If the X1 defender is over-playing O1 and denying the dribble into the right seam, O1 can dribble left (diagram F). O3 circles behind. Now O3 can attack the right seam (diagram G), while O1 pops back outside. This is almost like a "weave" action and will be demonstrated in more detail below. To give things another look, this time O3 cuts diagonally first, and then pops out to the opposite top guard spot (diagram H). 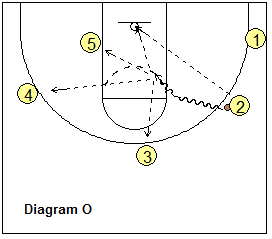 O1 dribble-penetrates behind O3's cut into the left seam. 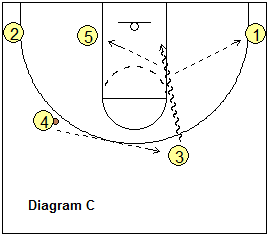 Notice that O4 is waiting the corner for the kick-out pass from O1 on dribble-penetration. If O1 is stopped at the elbow area or higher (diagram I), O4 ordinarily would slide up to the wing for the pass back out from O1. 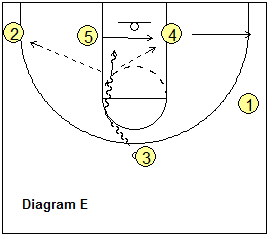 But another great option here (when the defender is overplaying) is a back-cut from the corner (diagram I). 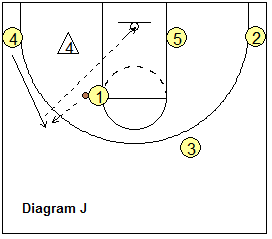 Diagram J shows O4 moving out on top for the pass and possible 3-point shot. Here the X4 defender often drops inside to help on O1's dribble-penetration, and this leaves O4 open for the 3-point shot. 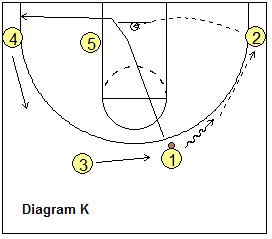 In diagram K, O1 dribbles right and passes to O2 in the corner. O1 cuts through to the opposite corner, and O4 and O3 rotate over. O2's options include a 3-point shot, or a dribble-drive either baseline or into the top seam. 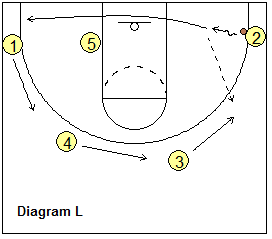 In diagram L, O2 dribbles baseline but realizes there is nothing there and passes back out to the wing (O3). O2 cuts through to the opposite corner and O1 and O4 rotate up. 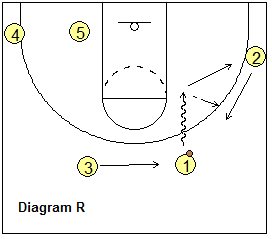 O3 passes to O4 on the top and re-locates to the corner. 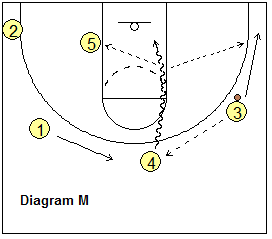 O4 can make the now-familiar attack up the right lane seam (diagram M). In diagram N, again we see the wing entry pass to O2. This time, O2 is higher out on the wing and O1 cuts to the ball-side corner. And again O2 could shoot the 3-pointer here. But this time we see O2 dribble-driving into the top seam. In diagram P, O1 dribbles into the right seam and drop passes to O2 moving up top. O1 fills O2's original spot. O5 re-locates to the right side. O2 dribbles once again into the top seam. O2 could shoot, dump pass to O5, or kick out to O4 or O3 (diagram Q). We can run a weave-type action with O1, O2 and O3, as seen the diagrams below. In diagram R, O1 dribbles toward the right seam and drop passes to O2 moving up top. O1 fills O2's original spot. O3 moves up to the top. 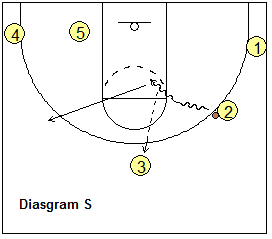 O2 dribble-drives to take the top seam (diagram S), but when stopped, passes back out to O3 and moves to the O3's left wing spot. O3 now attempts to dribble-drive into the right seam (diagram T). When stopped, O3 passes back out to O1 and replaces O1. 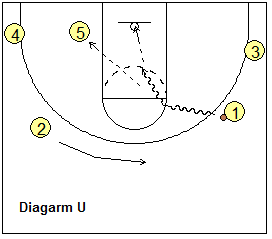 Finally, in diagram U, O1 is able to break down the defense and attack the top seam, looking for the lay-up, dump pass to O5, or the kick out pass for the 3-pointer. This weave action could go on indefinitely until one of our perimeter players finally breaks down the defense... or could end with the very first take to the hoop. You can see how players must keep moving with this offense, maintain their spacing and think "attack" at all times. To counteract this offense, defenses may use a sagging man-to-man, or "pack-line" defense, or may use a zone defense to clog things up inside. Regardless of the defense, if you have four good perimeter players, you should eventually be able to break the defense down by attacking the gaps in the zone.